With the real musky season wrapped up across the musky range, it’s time for the “sportshow season” of musky fishing. This is the time of year we watch fishing television shows, attend sportshows and do whatever it takes to make it until we can make our next cast. 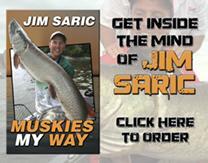 Consider this an opportunity to maximize your upcoming musky season. 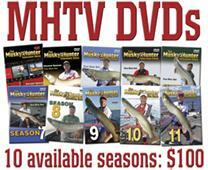 As musky anglers we are very fortunate as there are seven musky-specific sportshows. That means there are ample opportunities to commiserate with other musky anglers, who wish they could be fishing right now. Plus, it’s a great opportunity to check out the latest musky tackle, plan your next musky trip, and take in a seminar to learn a new technique. However, before you head to a sportshow, here’s a few things to do to maximize your experience, as well as a few ideas to prepare for the season. First, take a closer look at all of the musky rods and tackle boxes that were left in your basement or garage at the end of the season. Take a little time and make note of a few items that need repair and/or replacement. Believe me, it will help you purchase what you really need this winter. Of course if you see a hot colored lure, you better buy that too! Don’t make the mistake of waiting until spring to look over your equipment and then realize last minute you are in need of repairs or replacements. While looking at your musky rods, do you have any damage to your rods? Also, consider which rod additions you’ll need for next year. Now’s the time to decide. You are better off going to a sportshow with a specific rod-action in mind to cast certain lures, rather than randomly checking out rods. This will help you make the most of your winter-time rod purchase. Reels are an entirely different animal. Most likely there will be some reels that need repair or at a minimum a good cleaning. Be sure and loosen the drags on all the reels and put the ones that need repair in a bag. This way you can take the bag to someone who repairs reels and have them all fixed now rather than waiting until March or April. Also, at some shows Shimano has a repair table and they will teach you how to clean your reels under expert guidance. This is definitely a learning experience. Being a musky hunter, your tackle is worth a lot. We all have a large number of expensive musky lures and always need more. Take a quick inventory of which ones you will need duplicates or replacements. Plus, this will give you an excuse to go to one of the musky sportshows and purchase replacements, besides the many new lures you’ll buy because they look great or are simply the “next big thing”. In the end, you’ll come home with lures that you’ll really need. One approach is look at each group of lures, (i.e. crankbaits, topwater, etc.) and decide which color patterns are missing. You might have a bunch of perch pattern crankbaits, but few with cisco or sucker patterns. So, make a note to get a few of those. Finally, while on the subject of lures, if you are planning on fishing a new water next year, make a list of specific lures and colors you might need. Sportshows can be overwhelming, and the list just ensures you don’t forget something. Of course, there’s nothing wrong with spending another day at a musky show! Here’s my simple strategy when attending sportshows. The busiest times are when the show first opens and Saturday afternoon, unless you need a specific lure, try and avoid those times. If you have a specific lure or custom color pattern in mind, I would recommend being there when the show first opens and heading straight to that vendor and purchasing that first. It’s amazing how quickly the next “hot” lure can sell out, or new color patterns quickly disappear. From there take the time to check out all the new gear, chat with guides and resorts. If you are looking for a new place to chase muskies, all of the experts will be there and willing to provide helpful information. Be sure and attend a few seminars. We can all learn something new that may help us wherever we fish. Finally, relax and enjoy the experience, afterall, it’s a long winter. If you can’t attend a sportshow, you can still purchase all of the equipment you need at a local retailer such as a Bass Pro Shops or Cabelas or online specialty shop. Also, here’s a few other important things to consider to prepare you for the season. I keep logs of all of my musky catches and I highly encourage you to do the same. Before you start your new season, go back and complete your logs for your final fishing days. Just as important write down some notes on various lakes, patterns, etc. It’s amazing how simple, random notes can help you remember things when you fish a particular lake the following year. My fishing logs have data on all of my catches, but I also have a comment field that is helpful to use as a summary or a memory-jogger for future trips. This information takes minutes to update, but is simple invaluable. Obviously, take good care of your boat, motor and trailer, as it’s your largest investment and it’s important that it’s running properly the following season. Boat, motor and trailer problems always frustrating and can ruin a trip. Finally, make this winter a time to take care of yourself as well. Exercise and getting in shape will really help you when musky fishing next season, as you’ll be able to fish longer. Also, you’ll be less impacted by the weather elements and be able to better focus on the water. Plus, the benefits of exercise will help you in other aspects of your daily life as well. Musky fishing doesn’t have to end if you aren’t able to fish until spring. Make the most of the off-the-water season. Between taking a lure inventory and fixing equipment, attending sport shows, watching musky television shows, and reading books and magazines, and spending time on social media, you have a lot to keep you busy.